I’ve been interested in a hand-held gimbal for a while now and so my ears pricked up when DJI announced the new Osmo Mobile 2 earlier this year. The Mk2 unit has several advantages over the old one, much better battery life, a zoom slider, portrait mode and importantly, a much more affordable price. One downside though is the removal of the rosette accessory mount that was on the side of the old gimbal. With an up-coming project that was going to require great audio, I set about looking for a way to adapt the Osmo 2 for an external microphone. Even though the mounting thread on the side has gone, the Mk2 unit has a new tripod mount on the bottom of the grip. Bingo. So after some experimenting here are the components I used to build the rig in the photo above. The DJI Osmo Mobile 2 itself is now just £129, down from around £290 at launch for the Mk1 unit. The new camera stabiliser holds any smart phone as long as it’s between 58.6mm and 85mm wide. The way it clamps the phone means it’s almost impossible to plug an external microphone into a modern iPhone (one without a headphone socket), although more on that later. As before Osmo 2 uses Bluetooth Low Energy 4.0 to connect to your phone and a 2 hour (2 amp) charge provides a theoretical maximum of 15 hours service from its 2600 mAh battery (with a fully balanced gimbal). The unit’s overall measurement are 295×113×72 mm (folded) and in use it can move its 3-axis gimbal at up to 120° per second to keep things smooth. As well as normal stabiliser duties it can perform a series of other tricks including a very impressive AI powered ActiveTrack, Motionlapse and Hyperlapse as well as stitched panoramas. This little guy is a bargain at around £40. 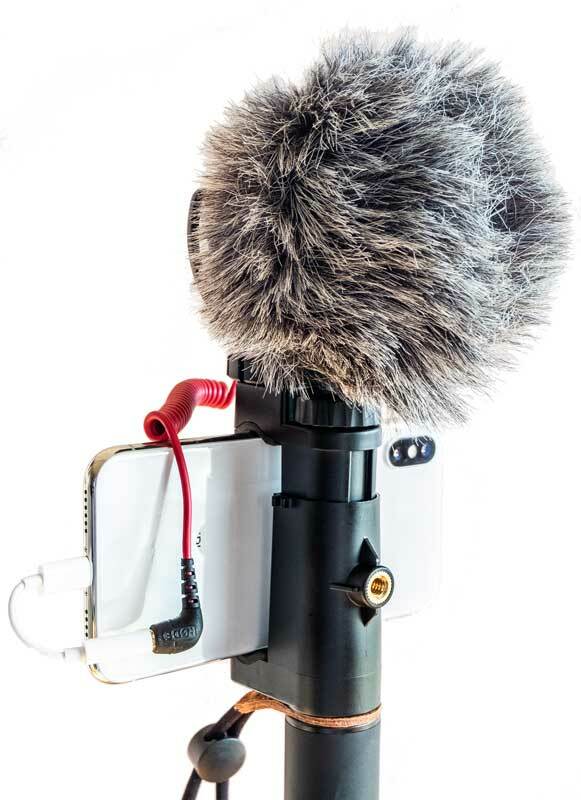 It comes with its own Rycote Lyre shock mount to isolate it from bumps and knocks. It also comes with its own deadcat that’s great at suppressing wind noise if you’re recording outside. The all metal body is just 80mm long so it’s small enough to be easily packed away and big enough to capture great audio with its cardioid condenser mic. (TIP: Order this RØDE SC7 3.5mm TRS to TRRS patch cable to use the mic with your smartphone instead of the Zoom, cutting out the need to sync the external audio in post production). I’ve had my eye on one of these for a while now, in fact I bought the old model (H1) a few months ago. The day after I got it, the new model was announced so I returned it and waited for stock of the new version (H1n) to appear. At £100 its pretty much unrivalled in terms of quality and features and it’s a unit you’ll see used by many vloggers and journalists alike. You can use the Zoom’s built-in XY microphones if you want to simplify the setup without the Rode. This accessory is only required if you want to use your GoPro with the Osmo Mobile instead of your smartphone. There are lots of these available at all sorts of prices. This SIOTI adaptor plate works with a wide range of GoPros (3, 3+, 4, 5 and 6). I was impressed with the quality of the all-metal construction and its built-in counterweight allows it to balance in the Osmo. If you have a GoPro already then it’s an inexpensive option to use its wide-angle view as an addition to your smartphone camera. (TIP: To ensure you don’t get the gimbal in your shot when shooting wide, either mount your GoPro backwards in the Osmo (so you’ll hold it with the buttons facing away from you) or mount it normally and hold your Osmo Mobile 2 in front of you like a flash light). There are plenty of L brackets to choose from but this seemed perfect for my needs. I have a few other camera accessories from Neewer and they’ve always been reliable and affordable. This one is no different at under a tenner delivered. It’s the heart of the whole setup and with its tripod screw it easily attaches to the bottom of the Osmo Mobile 2. Then the 2 hot / cold shoe mounts are where the recorder and external mics sit. While it is possible to get the mic in your shot if you pan around (especially with the dead cat on) it’s far enough away for the mainly forward facing shooting I’ll be doing. (TIP: You can use a 1/4″ male to 1/4″ male threaded tripod screw adapters to mount the mic or recorder on the bottom of the L-bracket if your prefer). 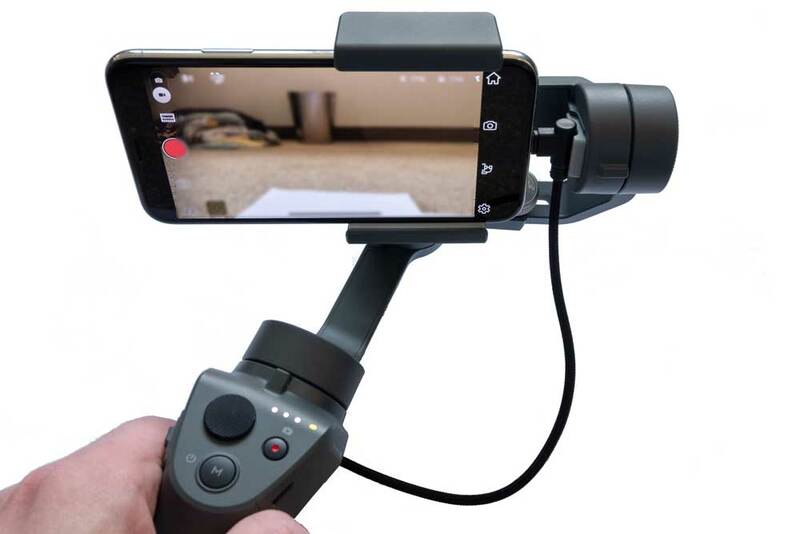 If you want an inexpensive way to try making videos on your smart phone then here’s a grip for under a tenner that’s almost identical to the one I used previously. This is a smartphone holder with an adjustable screw-down clamp as well as a cold shoe mount for an external mic and tripod threads too. With no clamp on the end it’s easy to use with the Apple Lighting adaptor as well. It can hold a phone between 50mm and 92mm so is suitable for most Apple iPhone’s, Samsung Galaxy, Sony, Xperia, Nokia, Lumia Nexus, Pixel etc. The Osmo 2 weighs ‎485 grams. The components above (not the GoPro adaptor) create the Steadicam rig in this photo and add an additional 320 grams to the overall weight. If you don’t use the Zoom field recorder and are able to plug straight into your smartphone to record audio then than drops to about 210 grams of additional weight. it doesn’t affect the balance of the gimbal and allows you to use both hands which feels good. If you have access to a 3D printer then there are quite a few Osmo Mobile accessories around that you can use to mount your GoPro Hero or Session etc. Hopefully STL files will start appearing specifically for the Osmo 2 soon, especially for a base mount. Helpfully the gimbal does still work when you use its USB port to charge a device. So along with a 90 degree Lightning cable like this you can be charging your iPhone from the Osmo 2 while still recording. The rounded barrel shape of this lead fits well and its 20 cms length seems like the optimum for this job. You could also mount your phone in the gimbal and have your GoPro mounted on the top shoe on the L-bracket for some B-roll footage. Although you’re not going to get a wildly different view from there, the wide-angle look from the GoPro should add something useful. Alternatively you could mount it looking backwards so you can record a selfie view at the same time. If you want to connect your mic to your iPhone then you could sacrifice one of Apple’s lightning to 3.5mm adaptors. The clamp will undoubtedly break the wire over time as it squeezes it at 90 degrees though. An alternative may be this unit. I’ve not bought one to test, but you might be able to use one of these then plug in Apple’s own Lightning to 3.5mm adaptor to use as a mic input (as long as it allows the gimbal to balance too?). None of these are very elegant solutions though, so there’s definitely a gap in the market for a right-angled Lightning to microphone input. 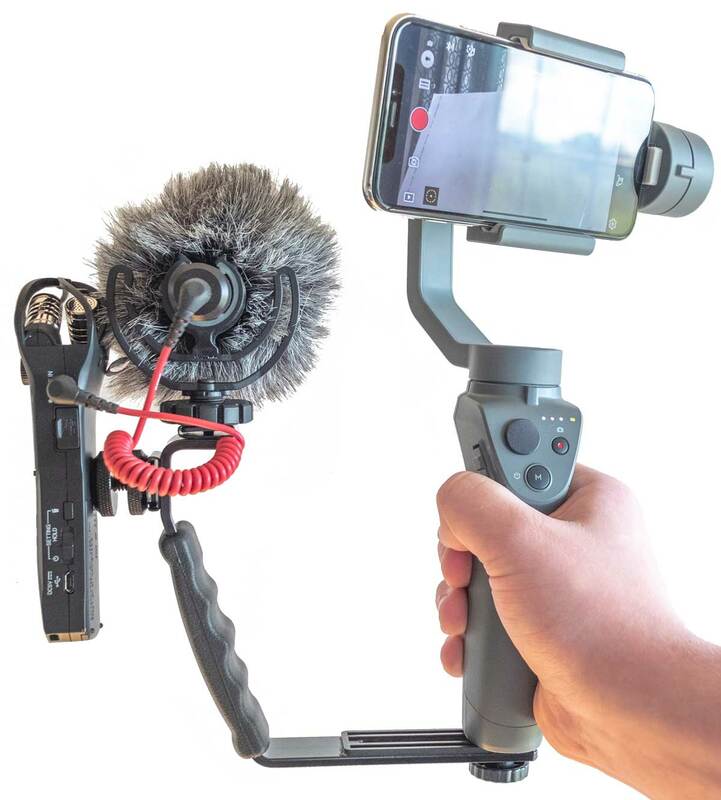 We’ll be testing this rig in an upcoming event and also using this dual headed Lavalier microphone with the Zoom to record some interviews too. In the meantime if you have any other useful tips to improve this setup let us know in the comments below. Previous articleCelebrate with Mother’s Day Tulips, Fresh from the Farm!